I grew up in the era of the boom box. 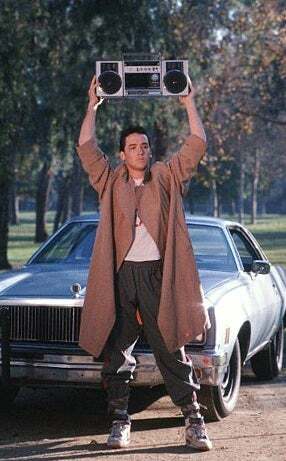 If you don’t know what that is, it’s that giant portable stereo John Cusack held up in the movie Say Anything. If you’ve never seen Say Anything, you really should. Not just for the boom box scene, but it’s a really great movie. Anyway, teens and young adults in the 80s rarely went anywhere without their boom box. Then the Sony Walkman came along and made listening to your own music portable. I still have two Sony Walkman players. I don’t use them, but they are filled with so many memories. Today, with smartphones it’s easy to carry our music with us. The problem with that has been the lack of shareability. Sure you can crank up the volume and put your phone in an empty bowl to act as an amplifier, but who carries a bowl around with them? And while it works to some degree, the lame factor is quite high. And if you’re a parent of a tween who wants to be cool with her friends, a phone in a bowl is not going to do it. As a Verizon Insider, I was sent the new Ultimate Ears Boom 360º Sound portable wireless speaker to take for a techdrive. Perfect timing for many reasons. Out of the box, the speaker was ready to go in under 5-minutes. I like to work in quiet, but CycleGuy always has something on in his office so we set it up there and he was listening to podcasts and music in no time. As he was heading out of town, he tossed the speaker in his bag because he hates the quiet of hotel rooms, and it’s also a speakerphone so he can use it for phone calls using the Samsung Galaxy Note 4 or his Kyocera Brigadier. With Spring in bloom, we’re spending more time outside. In the past we’ve relied on the house speakers, but then we’re kind of stuck having to be near where they’re mounted. Problem is I rearranged our outdoor seating and the sound doesn’t reach the new area very well. The Ultimate Ears Boom speaker was exactly what I needed. It’s designed for any lifestyle, which makes it great for me and my family. One of the coolest features, though, is the Alarm. It’s a newer feature that was an update to the app and I’m pretty sure I’m never getting the speaker back from CycleGuy. With all the traveling he does, this new Alarm feature may be his new favorite reason for taking the speaker with him. I know that it’s coming with us to Israel this summer! So whether it’s for the office, out by the pool, at the beach, or pretty much anywhere you want great sound, the Ultimate Ears Boom is a must-have accessory. I have the Blue Steel color, but it comes in nearly 20 different colors and patterns. Priced at $199 and available from Verizon Wireless or from the Ultimate Ears website it’s a good value for the versatility it brings. These would make a great gift for someone heading off to college or even a recent college grad. Great for work AND play!